I’m a little bit conflicted on this one. It’s not a bad film, but it certainly isn’t a great film, and to an extent it feels like George Clooney didn’t know what kind of film he wanted to make, and how to get the best out of his star studded cast. 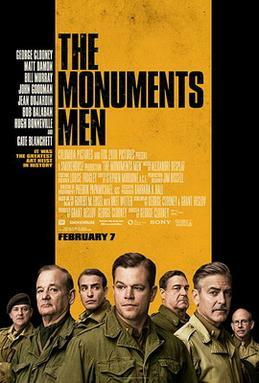 It’s focused on an interesting story from World War 2, about a serious of art experts (appropriately titled ‘The Monuments Men’) who were thrust into the forefront of the action with the remit of recovering stolen pieces of art that the Germans had taken. The problem with Clooney’s direction is he doesn’t know whether he’s making a war caper film, in the spirit of ‘The Great Escape’, or whether he’s making a serious war film about the bravery of these men to preserve valuable pieces of our culture. And that’s the rub, the clash of styles doesn’t always work, and it’s most noticeable in a couple of death scenes which fall a little bit flat, and don’t seem as important as they really should. That being said, it’s always fun watching the likes of John Goodman, Bob Balaban and Bill Murray play off each other, and those pairings (Goodman with Jean Dujardin) contain the film’s most entertaining moments, whereas the scenes with Matt Damon and Cate Blanchett fall a little flat. As a summary, the film is worth seeing, particularly for anyone, like me, who loves pretty much everything World War 2, but ultimately it boils down to the fact that the loss of art will never be as powerful as the loss of people, and the film never really overcomes that.